A 68 year-old male with a history of hypertension, diabetes, hyperlipidemia, chronic obstructive pulmonary disease and congestive heart failure (CHF) with depressed ejection fraction presents via ambulance with a chief complaint of shortness of breath. EMS reports that the patient was tachypneic and saturating 80% on ambient air on their arrival. En route, he received nebulized albuterol, nitroglycerin and was started on non-invasive positive pressure ventilation (NI-PPV). On arrival, he remains uncomfortable-appearing with a respiratory rate of 35 breaths/min and accessory muscle use. His heart rate is 136bpm, blood pressure is 118/85mmHg, and he is saturating 95% on an FiO2 of 100%. Attempts to obtain a history are limited due to difficulty comprehending his responses with the PPV mask on, and prompt desaturation with it off. Lung auscultation is similarly challenging due to ambient and transmitted sounds, although basilar crackles and diffuse expiratory wheezing are appreciated. Cardiovascular examination reveals a rapid and irregularly irregular rhythm. Assessment of jugular venous distension is limited due to the patient’s body habitus and the presence of mask straps around the patient’s neck. Lower extremities demonstrate 2+ pitting edema, symmetric bilaterally. Intravenous access is established and laboratory tests are sent. The ECG technician and portable chest x-ray are called. The case presentation above demonstrates a common emergency department scenario: a critically-ill patient with undifferentiated dyspnea. Specifically, the scenario reveals a situation where the physical examination is either obfuscated by technical challenges or otherwise indeterminate. The patient is at risk for deterioration and targeted intervention is mandatory. If a COPD exacerbation is assumed, additional nebulized breathing treatments are indicated – a potentially costly jolt of beta agonists if the patient’s atrial fibrillation and rapid ventricular response are the consequence of decompensated systolic heart failure. Take the route of decompensated CHF and prompt afterload reduction with diuresis would be next – if incorrect, not only would the primary cause go untreated, but his tenuously-maintained blood pressure may suffer. An approach incorporating point-of-care ultrasonography may be useful. First, a thoracic ultrasound is performed where certain causative etiologies might be identified immediately – for example absent lung sliding suggesting pneumothorax, or signs of generalized or subpleural consolidation. Other findings on lung ultrasound may point to causes that are not primarily pulmonary. For example, if diffuse B-lines are encountered a focused cardiac ultrasound can be performed to grossly evaluate ejection fraction and estimate right atrial pressure. Finally, if the lung ultrasound is largely unremarkable (A-lines), a sequence of ultrasonographic findings including right ventricular dilation and the presence of a deep venous thrombosis would point to pulmonary embolism as the diagnosis. Lichtenstein DA, Mezière GA, Lagoueyte J-F, Biderman P, Goldstein I, Gepner A. A-lines and B-lines: lung ultrasound as a bedside tool for predicting pulmonary artery occlusion pressure in the critically ill. Chest. 2009;136(4):1014-1020. doi:10.1378/chest.09-0001. Copetti R, Soldati G, Copetti P. Chest sonography: a useful tool to differentiate acute cardiogenic pulmonary edema from acute respiratory distress syndrome. 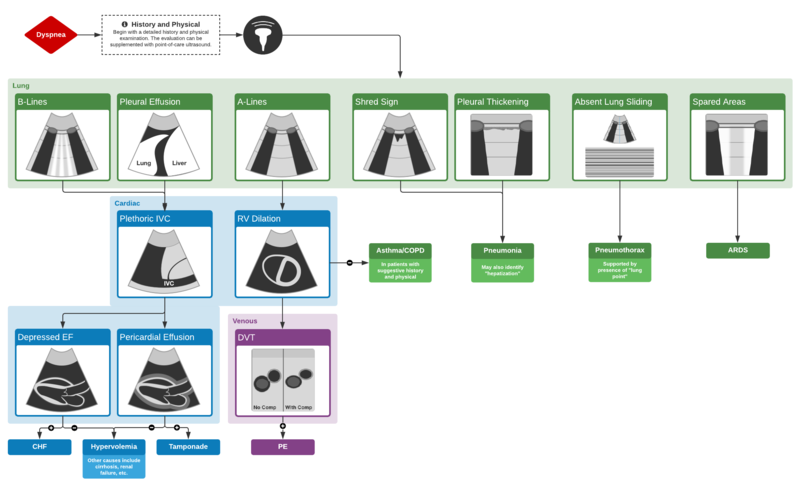 Cardiovasc Ultrasound. 2008;6(1):16. doi:10.1186/1476-7120-6-16. Gallard E, Redonnet J-P, Bourcier J-E, et al. Diagnostic performance of cardiopulmonary ultrasound performed by the emergency physician in the management of acute dyspnea. Am J Emerg Med. 2015;33(3):352-358. doi:10.1016/j.ajem.2014.12.003. Lichtenstein DA. Lung ultrasound in the critically ill. Ann Intensive Care. 2014;4(1):1. doi:10.1186/2110-5820-4-1. Zanobetti M, Scorpiniti M, Gigli C, et al. Point-of-Care Ultrasonography for Evaluation of Acute Dyspnea in the ED. Chest. 2017;151(6):1295-1301. doi:10.1016/j.chest.2017.02.003. Lichtenstein DA, Mezière GA. Relevance of lung ultrasound in the diagnosis of acute respiratory failure: the BLUE protocol. Chest. 2008;134(1):117-125. doi:10.1378/chest.07-2800.